Thousands of mourners, Muslims and non Muslims, gathered to pay their respects in Louisville, Kentucky the hometown of Muhammad Ali, as he was laid to rest over a two day event starting on June 9th 2016. Eulogies by family members and friends were delivered at the funeral, pre-planned by Ali himself. One could say he was still having the last word, right up until the very end. This man’s legacy was as broad as it was complex. Ali has been described as controversial, inspiring and polarizing all in the same sentence. Besides being one of the greatest boxers of all time, he is also remembered for his energizing effect on the freedom movement in America, back in the 1960’s. His refusal to be conscripted into the army in 1966, as a conscientious objector on religious grounds meant that he could not get a boxing license in any American state and he was also stripped of his passport. Later Ali was able to overturn these decisions and went on the fight the good fight once again. So; let us take a look at his horoscope and see what made him the greatest. Muhammad Ali was born Cassius Clay, under the sign of Capricorn on 17th January, 1942 at 6.35 pm in Louisville, Kentucky but later changed his name to Muhammad Ali. People born under the sign of Capricorn’s are hard working, serious and very ambitious. They are usually conventional and like to stick within the square. 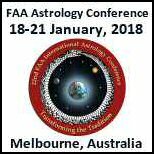 However; there was nothing conventional about this Capricorn personality as he had the Moon, Mercury and Venus all in the sign of Aquarius, giving him the courage to get outside the square and explore new ideas and blaze new trails. 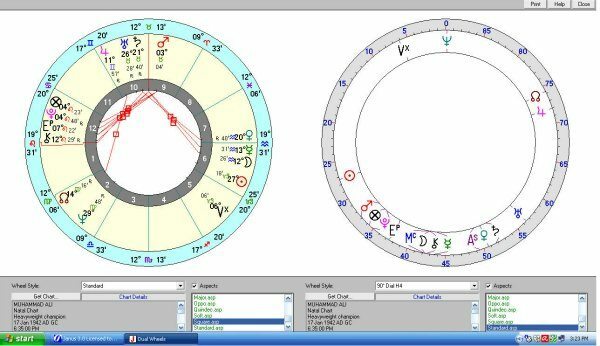 He had a strong Aquarian signature which gave him his original thoughts and ideas. He was able to see things that were wrong and wanted to put them right. Aquarians can do a lot of good in the world. However, his strength came through his Mars in Taurus which has all the makings of a solid citizen. He worked hard, was persistent and like the working bull, was able to work resolutely towards his aim come what may. 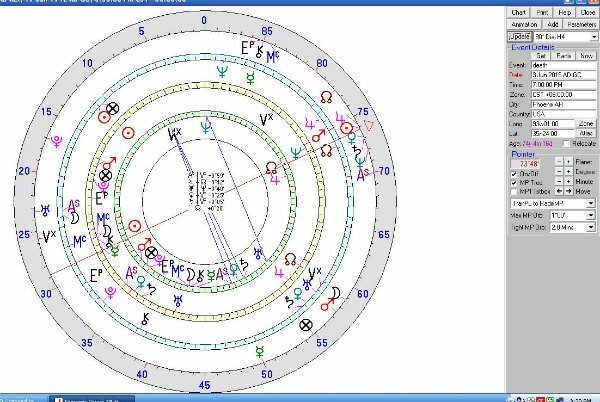 As well as a stellium in the fixed signs starting with the planet Mars and ending with Saturn he had a string of powerful midpoints to his Mid Heaven. (Career Potential) Combined with the Ascendant in Leo it all helped with the bravado and the determination to conquer and win at all costs. Ali also had Jupiter to the Moon’s Node which indicated his personal charm, charisma and a high profile with the public. 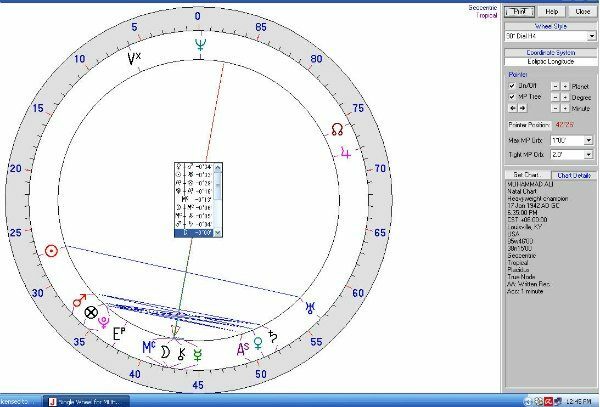 On the day he died this pattern was triggered by the Sun, Jupiter, Venus, Saturn and Neptune, bringing an end to the life of one who was truly the greatest. 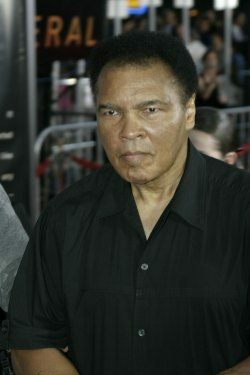 Ali courted controversy for most of his life and spent many years being criticized by others but it has been said “that some highly gifted people, sensing that someone is more gifted than them, will do all they can to discredit them, frequently using their position to harm their ‘opponent’. In the end, however, the truth will out – it can never be entirely silenced, and something which is inherently good will always survive in some form no matter if it takes many years for it to be recognised.” When the good finally came out – we listened. I remember 1964 for three things, picking Cassius Clay as he was known back then to beat Sony Liston (USA) World Heavyweight Champion against the odds, the Beatles came to town and I sat five rows from the front at their concert and I got married for the first time. Muhammad Ali’s personal successes are too long to list. However, his extraordinary boxing career only encompassed half of his life. He spent the rest of his time here on earth sharing a message of peace and inclusion in this world. “He was the champion boxer and civil rights warrior with a razor-sharp tongue. Muhammad Ali.